Refusal to feed at the breast is called nursing strike or breastfeeding strike. This can happen without warning when suddenly your baby is crying or refusing feeding as she has decided she doesn’t like nursing anymore. This could be for a number of reasons . Some of the main reasons this may happen is anxiety or change in a child’s environment. If anxiety is the cause, then reasure and offer the breast calmly at regular intervals but do not persist if your child appears anxious but try again in at the normal feeding time. Some babies’ prefer the bottle especially if more than one has been introduced . This can be very distressing for the mother but it important to remain patient and calm and to keep trying to encourage your little one to breastfeed to resolve this feeding issue. Simple changes such as wearing a different perfume or shower gel can also create nursing strike. Most nursing strikes only last 24- 48hrs but it’s important to provide fluids in another way such as expressing, offering water and adding fluids to foods. If you have tried everything and the issue persists, seek help from a trained infant health professional or GP. Infant sleep challenges, which approach should you use? There is so much advice out there in relation to child sleep difficulties but one aspect that is confusing is the right approach to use to help babies sleep. You may have read the latest advice from health/science journal’s stating that it is acceptable to move your baby to their own room at six months old, but it is also important to secure the attachment between baby and parent/s. This can sound confusing and challenging when you are weary and sleep deprived. You feel guilty leaving your crying child who frequently wakes numerous times for no apparent reason, but you have no idea how to approach the sleep difficulties. The latest sleep advice incorporates a holistic approach and it involves looking at the bigger picture. We know that this approach may improve sleep long term as well as health outcomes. And finally, it has been identified that infant sleep challenges are more likely to resolve if parent’s can choose how they prefer to approach the difficulties. This style and the current sleep advice is how I practice, which may explain why my approach works so well long term. Infant sleep challenges can be complex but my skills, knowledge and onging support, provide you with the most superior service available. Some sleep training methods may appear to work for some children but many parent’s report that the sleep problem can reoccur at a later stage. This regression may be due to other factors that have not been identified such as feeding, behavioural, developmental, environmental factors and supporting good attachments. Part of my work involves reading, sharing and understanding the latest sleep support research that protects and nurtures a child’s emotional health. 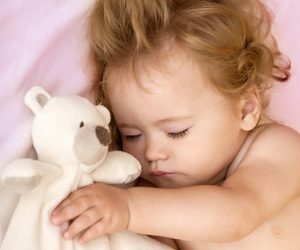 As more research is performed on child sleep challenges, it is becoming widely recognised that there are many other factors that can prevent a child from sleeping. My sleep methods use a holistic approach and I make these recommendations as part of your personal sleep plan. I also incorporate a very gradual approach where your baby is not left to cry. The pace of this approach can be adapted in response to your baby’s cues so it’s flexible. while their child learns healthy sleep patterns. The four hours additional service that is offered in follow up to my sleep packages, provides parents with the on going support they need for successful outcomes. I also offer further advice in relation to diet, weaning and developmental milestones so my packages are fully comprehensive. To hear more please book a free 15 minute consultation available on the Home page. I look foward to helping you. Should my child still need night feeds to help with sleep? Some of the families’ that ask me for help are at their wits end as they are getting up in the night numerous times to feed their child, many are aged over 12 months of age. This article will outline general guidelines on babies’ needing night feeds and identifying if your child is using you, feeds or both as a sleep association. Babies do vary in terms of milk feeds in the night depending on their age. Children who are 12 months old and over, should be weaning off their night feeds and contented after their evening milk until at least the early hours of the morning. Some ‘experts’ feel that babies do not need night feeds from 4/6 months of age. Evidence suggests that with baby led weaning, babies need time to feel confident with food and it’s is not realistic to expect babies to just drop their milk feeds at six months of age. Some children are not eating three meals a day until around 9-12 months so consequently you wouldn’t expect babies to stop asking for night time feeds until around this age. Below is a general guide to babies’ night feeds but this can vary from baby to baby and breast fed babies will feed more often. Obviously, growth spurts are an exception and you should feed as needed during those episodes. Growth spurts are generally over within a week. Babies’ that are not eating or drinking well due to illness or eating difficulties will require more milk feeds at night. Problems with sleep associations happen when babies are waking numerous times in the night for feeds but are not actually hungry or feeding. How can I tell if my baby is not hungry but waking due to habit or a sleep association? Signs that this may be happening are when older babies’ are waking frequently through the night and are happy to feed or nurse for short periods to help them get back to sleep. Other signs are when children are crying for you to go in and see them regularly through the night. As a health professional I would advise that this attachment is healthy as babies’ will eventually sleep at night when they they are emotionally ready. Brain maturity in relation to night sleep can happen at different stages for each child. Infant sleep support is delivered when a child is receiving an inadequate amount of sleep for their age and it is impacting on other areas of health and development. Other reasons can relate to over feeding to sleep, anxiety that inhibits sleep or showing no signs of independent sleeping as they grow older. The emotional health of the family must also be taken into consideration as a happy less sleep deprived mum/dad may result in a happier, healthier baby. Dream Sleepers only use a healthy and gentle approach to sleep support that is recommended by health. SIGN UP! To recieve the latest sleep tips. Babiies’ and young children can become ill during very hot weather and could suffer from dehydration, sunstoke or heat exhaustion. Babies’ sleep can sometimes be disturbed if they are too hot and need extra hydration. Older infants should also be kept out of the sun as much as possible, particularly in the summer and between 11am and 3pm when the sun is at its strongest. If you go out when it’s hot, attach a parasol or sunshade to your baby’s pushchair to keep them out of direct sunlight. Apply a sunscreen with a sun protection factor (SPF) of at least 30 to your baby’s skin. Make sure the product also protects against both UVA and UVB rays. Apply the suncream regularly, particularly if your child is in and out of the sea or paddling pool. Make sure your child wears a sunhat with a wide brim or a long flap at the back, to protect their head and neck from the sun. If you’re breastfeeding your baby, you don’t need to give them water as well as breast milk. 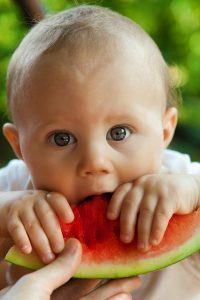 In hot weather your baby may want to feed more than usual so they are able to keep themselves hydrated. If you’re bottle feeding, offer your baby cooled boiled water throughout the day. If your baby wakes at night, they’ll probably want milk. If they’ve had their usual milk feeds, try cooled boiled water as well. If they’re over six months old and they get bored with water, try giving them a combination of very diluted fruit juice, ice cubes and homemade fruit juice lollies throughout the day. For older children, plenty of fruit, yogurts mixed with fruit and salad will also help keep their fluid levels up. Ensure your baby’s room is kept cool in the day by shutting their blinds to keep the heat out. The curtains or blinds should be a black out material so that your baby is not woken up to the early morning light. Run a cool bath before bed and dress in minimal clothes e.g. a short sleeve vest or a light top. Keep blankets to a minimum and use a well fitted sheet if 26 degrees or more. Ventilate the room well and have a fan in the room to cool the room down. A nursery thermometer will help you monitor the temperature of your baby’s room. Your baby will sleep most comfortably when their room is between 16C (61F) and 20C (68F). Offer water or milk if your baby wakes up and appears thirsty. What happens with lack of sleep? 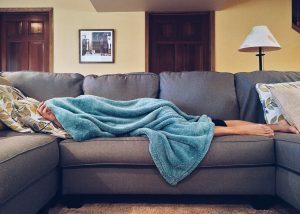 The latest research from Dr. Michael Moesley’s (May 2017) findings state that the less sleep adults and children receive, the more calories we consume. I would also like to point out that in my experience, younger children tend to eat less but snack more. With lack of sleep, a child’s behaviour and food intake can become chaotic as infants also appear to eat less and at the wrong times. Parents report that they eat more and cannot function resulting in a vicious circle for both parent and child. Parents also report that they feel too tired to go out with their child which then has a negative effect. Children need exercise for healthy development and adults need excercise for good mental health and well-being. The good news is that my sleep plans include all of these aspects such as the correct food groups, times of foods and the appropriate activities to help a child feel restful before bed. I also support parents through the duration of sleep support and more if needed, so that they feel confident and reassured when introducing a healthy sleep approach for their child. Read Michael’s Mosely’s research on my Facebook page blog. My baby won’t eat from a spoon! Are you tearing your hair out at meal times because your baby is not eating from a spoon? Try not to fret as your baby is actually reaching their developmental milestone. From around 8-12 months of age this is a common eating behaviour in babies’ as they are pushing for independence and learning. Finger foods are the way forward when you are noticing this behaviour and you can still give nutritious foods but in a different way. All vegetables can be cut into finger shapes and meat or fish can be mashed and put into parcels of bread, pitta or wraps. I even put a whole roast dinner into a sandwich at one point and it worked a treat. Babies’ still love to play with a spoon so it’s fine to let your baby get used to holding a spoon and attempting to feed him/herself, as this allows that feeling of independence. If you are worried that your baby is not getting enough nutrients it’s fine to help out in a fun way without ccompletely taking over. It is not essential for this age group to eat three full meals a day until after 12 months. After 12 months babies’ tend to start dropping their milk feeds when weaning has become fully established. If your baby is on a food strike and refuses to eat then it will probably mean he or she is not hungry. Babies are amazing at regulating their food intake. If however you feel that your baby is not eating well for a long period or displays very difficult behaviour at meal times, than speak to your G.P or health visitor. If you have a fussy eater than I would be happy to help as my food solutions really work. If I’m not a sleep trainer than who am I? I am of course, a health visitor who has studied and solved sleep challenges for many years. But how is this different from a sleep trainer? Firstly, I would like to say that my four year’s of studying infant health, stood me in good stead to understand what babies and children need to develop and thrive. I ensure that my approach delivers the right age appropriate advice keeping in mind all the developmental milestones that can sometimes interfere with sleep. Sleep training alone, may not protect the emotional health of your child therefore the sleep problem can reoccur. Babies’ and children need to feel secure before they can adapt themselves to a new way of sleeping and my approach prepares your child emotionally before the sleep methods are put in place. 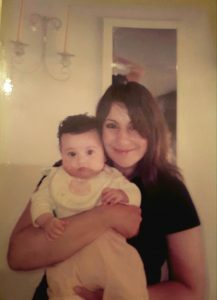 I have had years of sleep training and attend constant up dates of new research in breast feeding and support, (UNICEF Baby friendly) infant mental health, developmental reviews and solution focused support (helping parents feel confident to make changes). I also have knowledge in all aspects of child health which will provide your family with gentle, healthy and nurturing advice to help your infant develop healthy sleep patterns. And finally, I will support you throughout your families journey so you feel happy and confident to make the changes.